Morris Dancing is an expressive and athletic English ritual dance. Revelers will be familiar with Morris from May Day celebrations and the “Lord of the Dance” which traditionally closes the first act of the Christmas Revels. 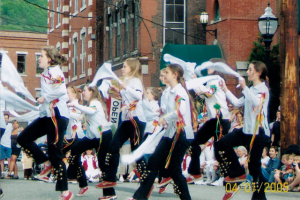 Members will learn a repertoire of dances, and develop a team culture while learning traditional techniques and Morris dance variations. As the team develops, we will have opportunities to dance alongside adult teams in the area as well as with other youth teams. Revels Youth Morris Team will be welcomed not just as members of the Revels community but of the larger Morris dancing community. The team will be lead by current Lord of the Dance dancers, Libby Chamberlin of the Rock Creek Morris Women and Gus Voorhees of the Foggy Bottom Morris Men. Both Libby and Gus grew up Reveling and Morris dancing and are excited to share this tradition with the next generation of dancers. See bios for Gus & Libby. Classes will meet every other Sunday, starting on January 15, at the Washington Revels Studio from 2-4 pm. DATE/TIME: Every other Sunday, 2-4 pm.